Today the first dogwood made it’s appearance in the woods. Spring is officially here. 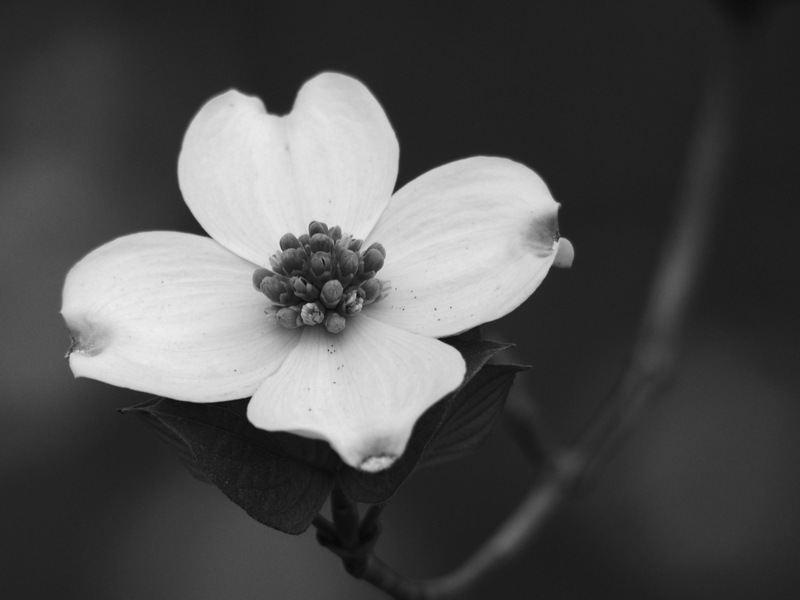 This entry was posted in Ozarks, Photography, wildflowers and tagged Arkansas, black and white photography, Dogwoods, Flowers, Olympus, Olympus E-M5, Ozarks, photography, wildflowers by artsifrtsy. Bookmark the permalink. Great to see dogwoods! Mine were so confused by the weather this year that their blooms were only half hearted. Our red buds are doing the same – I was glad to see the dogwoods came out strong. Good eye, were you driving when you saw it?? LOL – the white flowers in the woods are pretty easy to find. So glad that you got this shot. Excellent and striking image. If a tree blooms in the forest, and there’s no one passing by to record it’s beauty, does it have no purpose? When there’s no one about in the Quad’.” ~ Ronald Knox. No objection at all here. I think that all blooms have purpose, biological and physical – biology requires them, and philosophical purposes are left to us 🙂 I like to think the purpose is wonder – discovering a clutch of these in the remote woods is a thing of beauty. Glad I can live spring thru your photo… it’s still hasn’t made it’s presence known here… sigh. Soon… It has seemed as though winter has drug on and on this year. I am sooooo jealous! It snowed the last 2 days here and it’s cold. But I love the flower, because I remember how pretty dogwoods are from living in the south. 🙂 so you are forgiven my friend! Carry on! haha! Awww…love it. Thanks for making me homesick again. Sorry – I have been looking for days to find one open on the hillside. Do they not grow in OK? I saw the woods were alive with them this morning. I love dogwood. My most favorite flowering tree! THE signal of the arrival of spring, no doubt. Lovely capture, Lorri. Thanks Steph – they are my favorite too. I’m quite sentimental about them. By the weekend the woods will be filled with them. No pinks in the woods, but I noticed they are opening in town. The whites are native here. Oh, I can remember walking in the cool woods as kid when the dogwoods started to bloom. Layers of brown leaves slick underfoot after a spring rain. Clean, crisp air. Fresh, white blooms like little fairies floating in the trees. That description nails it! My mom used to say they were like angles suspended between heaven and earth. Thanks – they are like clouds in the woods here in the ozarks. Gorgeous shot and I’m so glad Spring has finally arrived. It seems there have been many ‘false’ starts over in the US & the UK. Well, it’s supposed to cool off a bit – but I think spring is moving forward – finally! Thanks! I especially love pink dogwood. Black & White photography. I can take a dose of that every day. Just lovely!